When I was in my teens I visited my grandmother on a regular basis. When she poured tea in one of those fragile porcelain cups, she’d start talking about the developments in the soap operas she followed. My grandmother was an avid watcher of The Bold and the Beautiful, As the World Turns and Days of Our Lives. So, you understand, she had A LOT to tell me about who dated whom, who wanted to kill whom, and which characters fell in love with each other this week. To be honest: I didn’t know what the hell she was talking about, since I never watched those shows. But to humour her, I never let on I didn’t know who Rich Forrester was. Now, why am I bringing my late grandmother and her daily television fetishes up? When I started reading X-Men: Ghosts, knowing I had to review this book for the ABC blog, I started to worry I might come across like my grandmother, because not only do these X-Men stories involve large casts of characters, writer Chris Claremont has a knack for weaving many threads of plotlines into his stories. He basically writes soap operas about characters wearing longer underwear. But let’s give it a try nonetheless. What the heck, there are worse things than being compared to my grandmother, who was a sweet old woman. The X-Men were created in the 1960’s by Stan Lee and Jack Kirby. Getting tired of figuring out scientific experiments and accidents with radiation that could give superheroes their special powers, Lee figured: what if they were born with their powers and these special abilities kick in when they reach puberty. So that’s how the race of homo superior, a.k.a. mutants, was born. In their first incarnation The X-Men were super powered teenagers who were enrolled at the private school of Professor Charles Xavier, a wheelchair-bound psychic. Under his leadership The X-Men tried to save humanity from all kinds of danger, especially mutants who wanted to conquer the world to make it a safer place for their own kind. You see, regular people are often afraid of these specially-powered beings, which make the X-Men stories full of metaphors about racism and the state of society as is. To be honest, the X-Men weren’t a big success at the time and after a couple of years Marvel only reprinted old stories for a while. In 1975 Marvel published Giant Size X-Men #1 by writer Len Wein and artist David Cockrum and that started a revitalisation of the title. The new team had an international flavour: members came from all over the globe and they weren’t mere teenagers anymore either. When Chris Claremont took over the reigns as author, the X-Men became one of the most popular comic books. 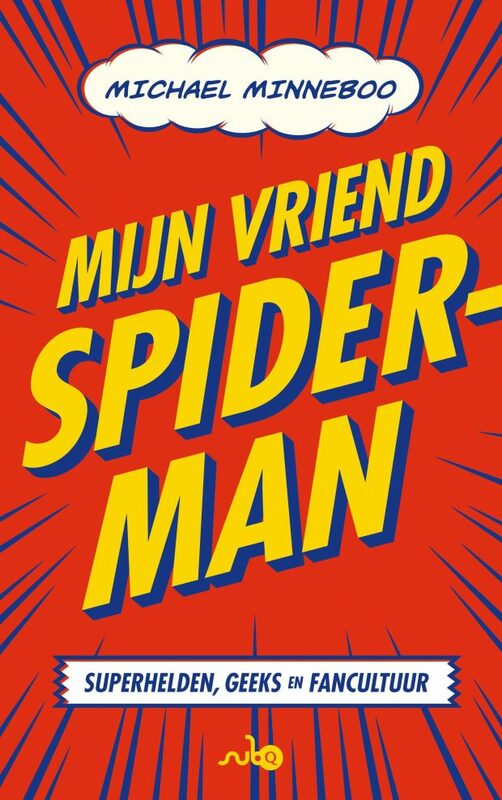 For a long period of time the series was the best-selling title, topping other Marvel publications such as Amazing Spider-Man and Avengers. X-Men: Ghosts collects a year worth of comics of Claremont’s mid-eighties stories. Claremont’s run on the title lasted about 16 years (!) by the way. 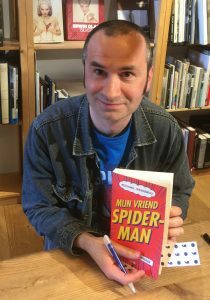 It isn’t very common that a writer sticks to one title that long in the comics industry. People who have seen the X-Men-movies will be familiar with most of the characters: there’s Wolverine, Cyclops, Storm, Colossus, Kitty Pryde and Rogue in this version of the X-Men. That’s not really surprising though, since the filmmakers took a lot of their story ideas from Claremont’s stories. Still, when one starts to read, it takes a while to get into the different storylines that were set out before. But don’t worry: the short synopsis at the beginning of the book helps a bit. Besides, just like a real soap, it only takes a short while before you’re right into the action and know who’s who. Comics have a serial form of storytelling, with issues coming out each month. The stories are always written in a way that accommodates new readers. This collection seems to focus on telepath Rachel Summers: in an alternate future where robotic Sentinels dominated mutants, Rachel Summers was Cyclops and Jean Grey’s daughter. Traumatized by being forced to hunt her fellow mutants as a “hound”, Rachel was later hurled back in time to the present. She became part of the X-Men. However she soon discovered she was not in her own past but in a different timeline: certain details were different, including her mother’s death. In X-Men: Ghosts Rachel claims her mother’s Phoenix power to battle a godlike creature called the Beyonder who threatens to destroy our universe. Trying to make amends for her chequered past, she makes some rash decisions a number of times. Although her actions are meant well, they do not seem to work out for the better. 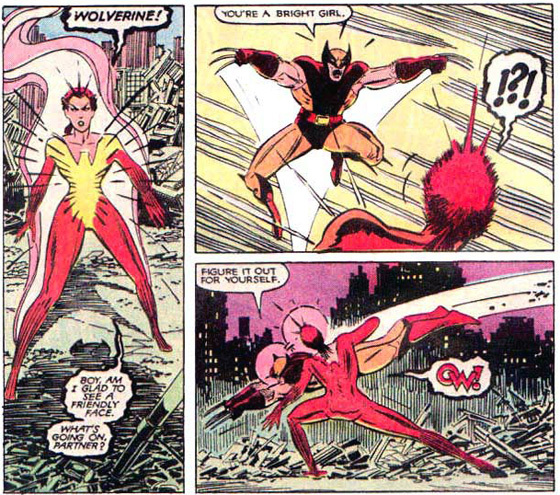 It is up to teammate Wolverine to stop the ever-powerful Rachel from becoming a ruthless killer. Also, Magneto, for years the nemesis of the X-Men, has become their friend since they learned of his childhood imprisonment in Auschwitz. Magneto decides to reform and when Xavier is mortally wounded, he asks his old friend to look over the X-Men. 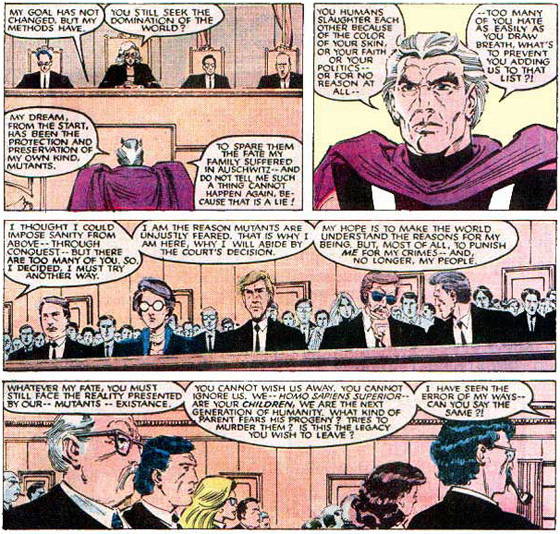 Magneto may be a good guy now, but being charged with crimes against humanity he still has to stand trial for the international court of justice. For me it was a real treat to re-read these stories from the nineteen eighties. Chris Claremont’s talented writing and great feel for dialogue turns these characters into living and breathing creatures that really have an impact on an emotional level. As far as superhero stories go, Claremont offers a nice mix between personal development of all the characters and action packed battles. I loved John Romita Jr.’s early artwork. He is still one of the best artists in the business today. Guest artists are Barry Windsor-Smith, Arthur Adams and Rick Leonardi. 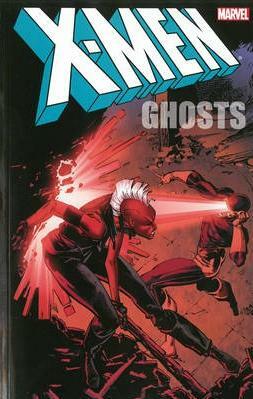 This paperback also contains two articles from Marvel Age, the official fanzine published by Marvel Comics at the time, focusing on the history of the X-Men and the art team of John Romita Jr. and inker Dan Green. The only problem I had with this trade is that, after the last page is read, the story is far from over and leaves you hungry for more. But isn’t that what soap opera is all about? This review was written for and published on the blog of the American Book Center.